from 5 to 16 years living with cancer. Camp Quality (New Zealand) Incorporated is a Charitable Trust established in 1985. Camp Quality is a totally voluntary organisation with no individual receiving remuneration. Thousands of hours each year go into raising funds and organising their programmes. Any child may attend a camp if they have been afflicted with cancer. They have campers in all stages of their illness. Each camp has a minimum of two Paediatric Oncology trained staff in attendance. In some circumstances siblings are also able to attend their programmes. Other support activities are run during the course of the year. These include, Family Days, Reunion Days, Mini-camps and social outings. At Camp Quality they are dedicated to bringing fun, hope and happiness to the lives of children living with cancer, their families and communities, through provision of high quality recreational experiences. Their goal is to provide fun and comradeship combined with achievable challenges to encourage the children to focus on the positive aspects of their lives. Camp Quality passionately believes in the power of fun to help children and their families overcome the challenges that cancer brings. activities. Each year Kids in Cars (KIC) has held a day for them offering rides firstly in cars and more recently cars and trucks. 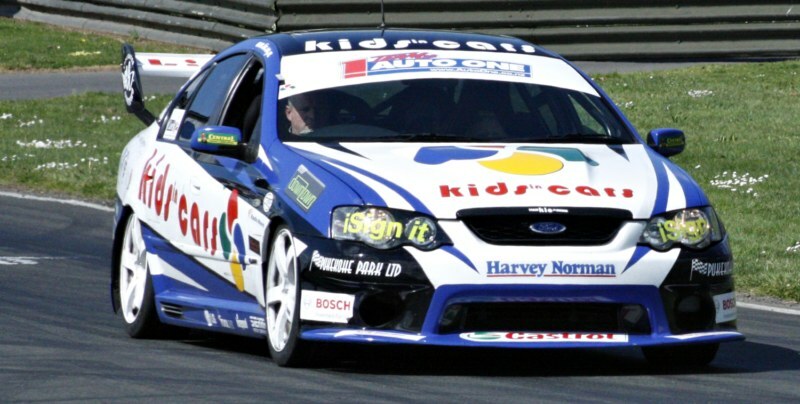 This annual KIC event has grown from roughly 5 cars about 6 years ago to a full on event held at Pukekohe Park Raceway where we hold car and truck shows, offer race car hot laps, exotic and road car laps plus truck ride laps. This event has been attended by over 200 cars and a truck convoy to Pukekohe with over 200 trucks. We also provide children's carnival rides and static displays and open this up to the general public to help raise funds towards the children's camps. KIC is very much like Camp Quality where is it run solely by volunteers and survives by way of supporters donations. The last 2 years Camp Quality has combined their Auckland - Northland and Waikato camps so they too could attend the KIC track days. This has been fantastic for all involved. Racing Ray Williams has become KIC's official ambassador and provides many hot laps to kids and adults in the Holden Monaro kindly supplied every year by F5000 competitor Hamish Paterson. This event was attended by Shane Van Gisbergen this year along with several NZV8 Drivers and also the likes of Greg Murphy, Shortland Street stars, NZ A1GP team and the NZ Fire Service.